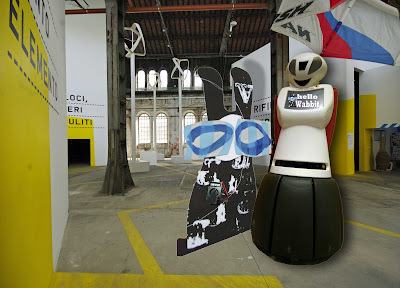 The Wabbit was taking a short cut through the Old Converted Train Factory when he heard an electronic voice. "Hello Wabbit, Hello Wabbit," said a Robot. The Wabbit looked up at a friendly robot face. "Meet and greet. Meet and greet," said the Robot. The Wabbit smiled. "You don't have to say everything twice." "I have to, I have to," said the Robot. The Wabbit thought for a minute and then he fished in his fur for an electronic meter that he'd bought in a market. He opened a hatch in the Robot's side and prodded with the electrodes. "Now say "Quando il coniglio, senza consiglio, con la coniglia, fece famiglia."" instructed the Wabbit. "Bel coniglio, Marcus Aurelius," said the Robot. The Wabbit snickered maliciously with all of his 28 teeth and made another adjustment. "Say, "I Robot."" said the Wabbit. "That's missing a verb," said the Robot. The Wabbit grinned, snapped shut the hatch and dusted his paws. "Would you care for some part time work?" asked the Wabbit. "I can't go out," said the Robot. The Wabbit reopened the Robot's hatch and made another adjustment. Then he stood high on his hind legs and looked all around. "We're just going for a little hop around!" shouted the Wabbit. "Any objections?" he bellowed. There was a long silence. "Did you hear an objection, Robot," asked the Wabbit.”I heard zilch, let's go," said the Robot.